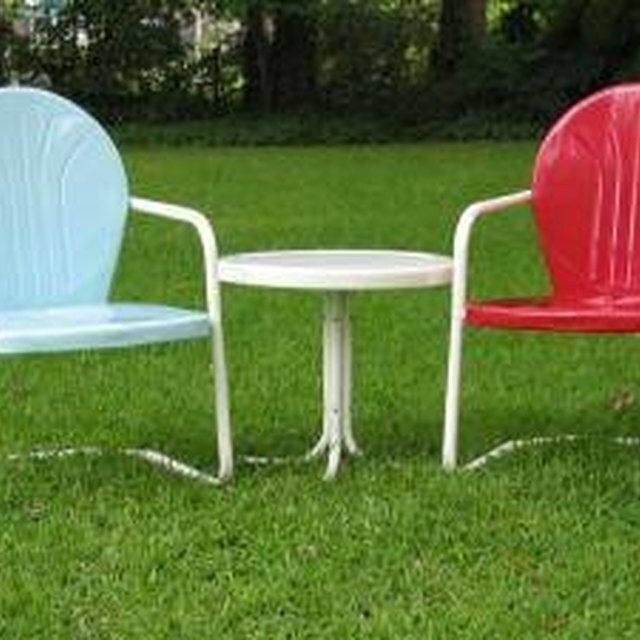 If you are on a budget, purchase cheap plastic lawn chairs as additional seating for your home. Although inexpensive, the downside to plastic chairs is that they look inexpensive. One way to spruce up a boring plastic chair is by decorating it with paint and various other materials. Adding décor to a boring plastic chair will make it look more expensive and stylish. There are several products on the market that cater specifically to plastic surfaces. Make plastic chairs more interesting with decorations. Purchase a semi-glossy or glossy spray paint made specially for plastic surfaces. Lay down a drop cloth or painter’s plastic in a well-ventilated area and place the chair on top of it. Hold the spray-paint nozzle about 12 inches from the chair surface. Spray the paint over the chair in a back-and-forth motion using long, even strokes. Add layers of spray paint gradually instead of trying to coat the chair in one application. Let the paint dry for the recommended amount of time indicated on the packaging. Dampen a rag with paint thinner and wipe down the chair. Let the paint thinner dry. Hold the nozzle of the plastic spray primer about 12 inches from the surface of the chair. Apply the primer in long, even strokes in the same manner as regular spray paint. Layer the primer until the chair is completely coated, then let the primer dry. Paint the entire chair using spray paint or brush-on paint. Once plastic is primed, any type of paint can be used on the surface. Let the paint dry in between layers. Paint flowers, shapes or abstract designs on the chair with flexible craft paint. Use puff paint or squeeze-on paint for fine lines. Place a large [stencil](https://homesteady.com/how-5159733-stencil.html) over the back of the chair and tape it all around the edges with masking tape. Drape the chair with painter’s plastic so you protect other parts of the chair from getting paint on them. Tape the painter’s plastic in place. The entire chair, except for the stenciled area, should be covered. Hold the plastic spray-paint nozzle about 12 inches from the surface of the chair. Spray directly over the stencil in a back-and-forth motion, lightly layering until the stencil is fully covered. Remove the painter’s plastic and the stencil. Allow the paint to dry for the recommended amount of time indicated on the packaging. Apply decorative, three-dimensional fabric stickers around the edges of a plastic chair to give it more flair. Purchase seat cushions to add comfort and color to a plastic chair. Or, purchase small throw pillows for each chair. What Is a Cricket Chair? What Paint Is Suitable for Plastic?